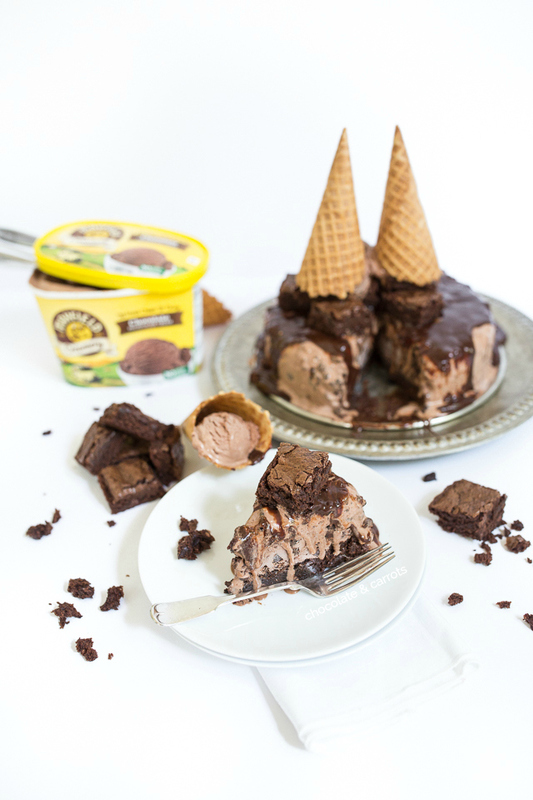 Caution: This may look like an unassuming chocolate ice cream cake, but after adding the toppings and cutting into it, you’ll find a chocolate explosion in every bite! You see, there’s a lot of commonality between this frozen treat and what’s happening at Mayfield Creamery. 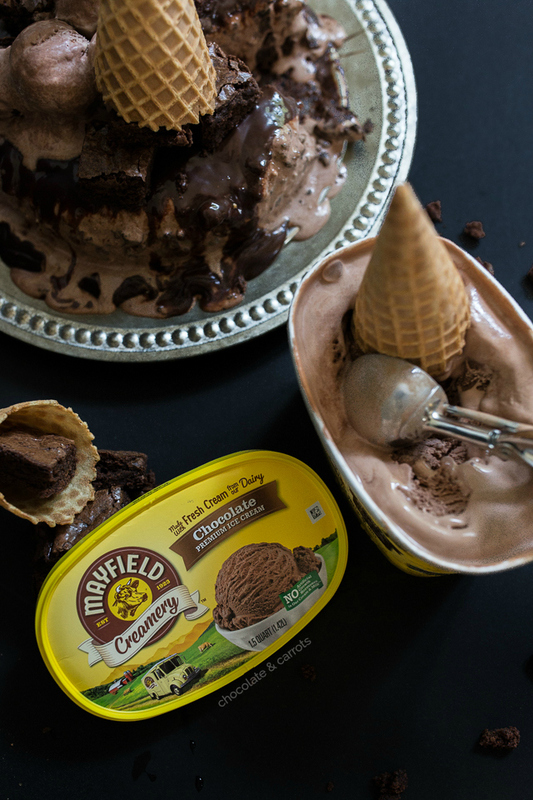 Mayfield Creamery ice cream has just rebranded and refreshed its packaging, while maintaining their values and traditions of the brand by keeping their time-honored commitment to making the finest quality ice cream, that can only come from real dairy. 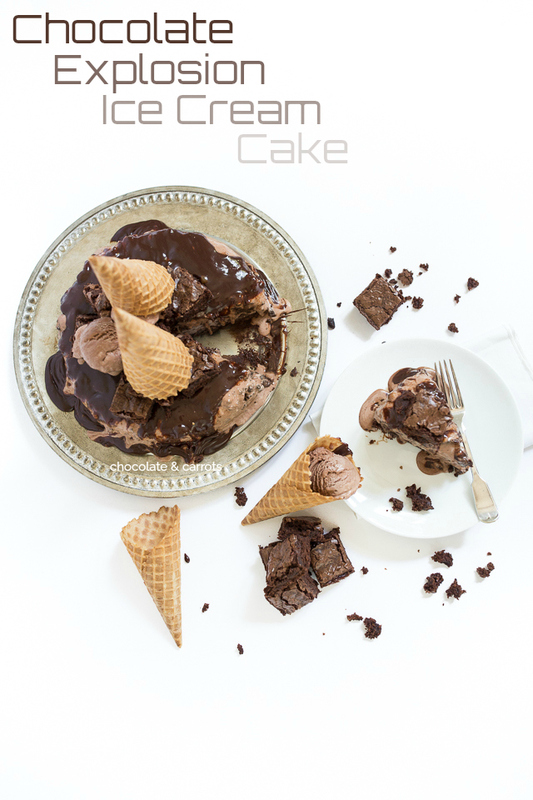 Likewise, this cake may look like your usual ice cream cake at first glance, but it’s a real show stopper! Every bite is rich, crunchy, creamy and above all else, chocolaty. Whether you’re making this cake for a special occasion or just a weekend treat, it’s quite easy to prepare ahead of time. If you don’t plan on eating it all at once, I recommend pre-slicing and freeze the individual slices to eat later. I served this glorious cake at one of my husband’s work get-togethers, where I pre-sliced it so they had a super easy and less messy time serving it. Okay. Back to the good stuff. Mayfield Creamery’s new packaging is lovely and really pops in the grocery aisle. It’s still the same good stuff in the inside, and now the variety of flavors is greater. Woot! Thanks to the Mayfield Creamery difference, using fresh cream from a real dairy with no artificial growth hormones, it’s sure to make an ice cream cake a special treat! Now, I’m going to go drool at that melty, ice cream goodness below! Bake the brownie according to the packaged instructions in a 9 inch springform pan. Allow the brownie to completely cool, then put in the freezer. Meanwhile, make homemade magic shell. Stir the magic shell and 25 crushed chocolate cookies. This will be the filling for the cake. Allow the Mayfield chocolate ice cream to set out at room temperature for about 15 minutes until softened. Once soft, combine 3 cups of ice cream with 10 crushed chocolate cookies. In another bowl, combine the remaining 3 cups of ice cream with 1 cup chocolate chips. In your springform pan, start with the brownie bottom. 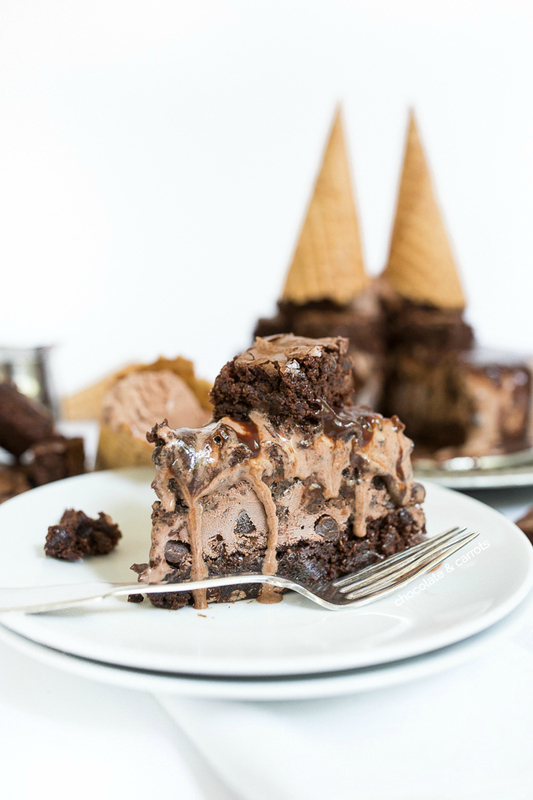 Spread the softened chocolate cookie – chocolate ice cream on top. Gently dollop and spread the filling (magic shell and crushed chocolate cookies) on top. Spread the softened chocolate chip – chocolate ice cream on top. 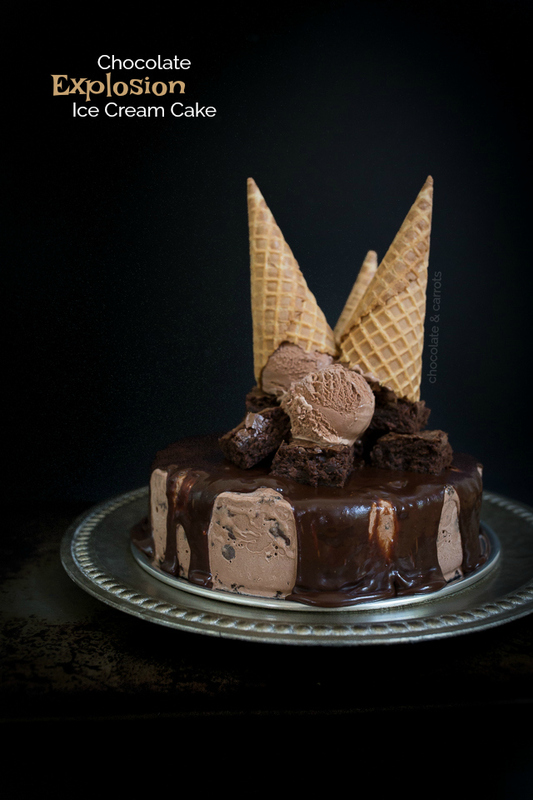 Freeze the ice cream cake for at least 2 hours or until hardened. Remove from the freezer and drizzle the hot fudge on top. 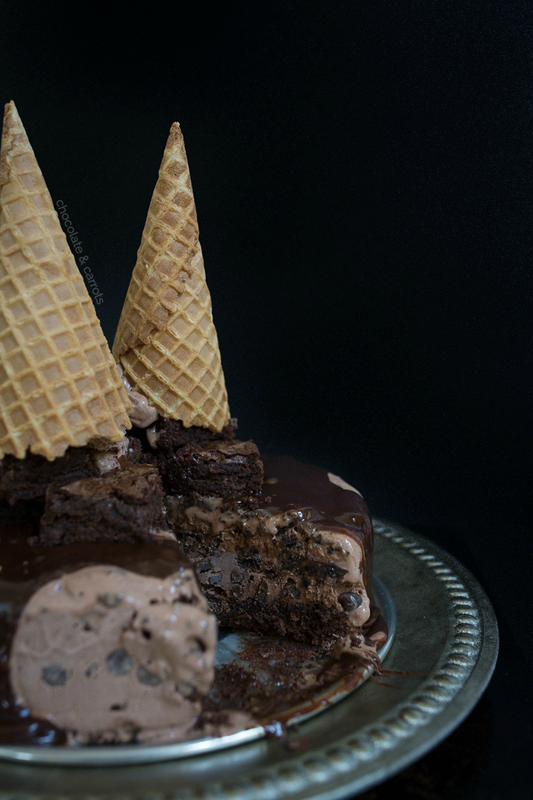 For added decoration, place brownies, scoop chocolate ice cream and/or waffle cones on top. Here’s the Mayfield Creamery Store Locator to see precisely where you can find their ice cream, pronto! For those of you here in the South Carolina, you can find Mayfield ice cream at Harris Teeter, Publix, Bi-Lo and Kroger. Whoa, this looks ah-may-zing! Totally have to make this for the kids this summer! oh my goshhh ALL THE CHOCOLATE!! !